Which ways can we augment or reshape the buttocks contouring? 3rd. Injectable Hyaluronic acid implant. Who is eligible for a Buttock Augmentation with fat grafting? It is primordial for the patient to have a sufficient fat quantity in his or her body so that we can proceed to fat transplantation to the buttocks. This is because we will then be able to extract the fat quantity needed for the operation. Given that 50-70% of the transplanted fat will be absorbed within three months after the surgery, a double or triple amount of fat should be extracted in every fat transfer operation. Thus, it is clear that underweight or excessively thin men and women are excluded from this treatment. What type of anesthesia is applied when performing Buttock Augmentation with fat transplantation? 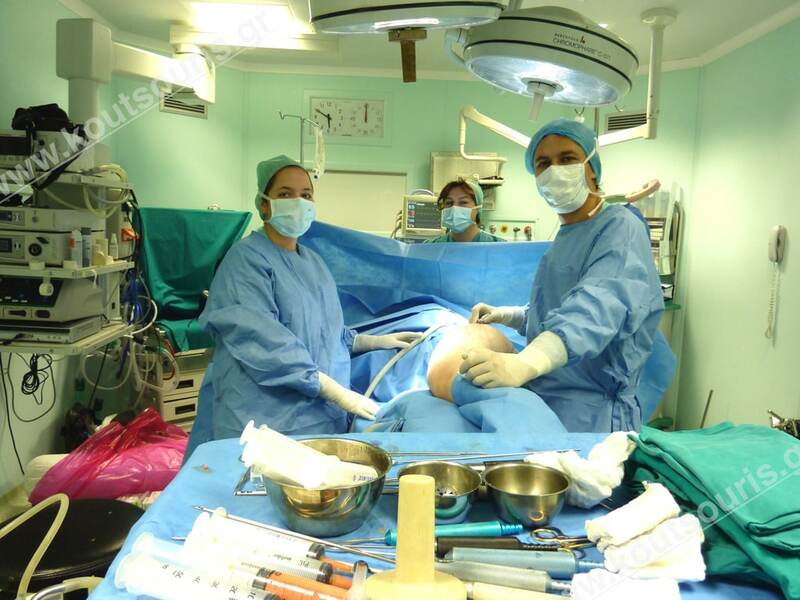 Fat transplantation to the buttocks is usually a long procedure with many technical particularities. The patient should remain calm and the surgeon should be very meticulous and methodical. On the one hand, we should extract a large amount of fat from the donor area(s) and on the other hand, we should transplant this fat in many areas of the gluteus. 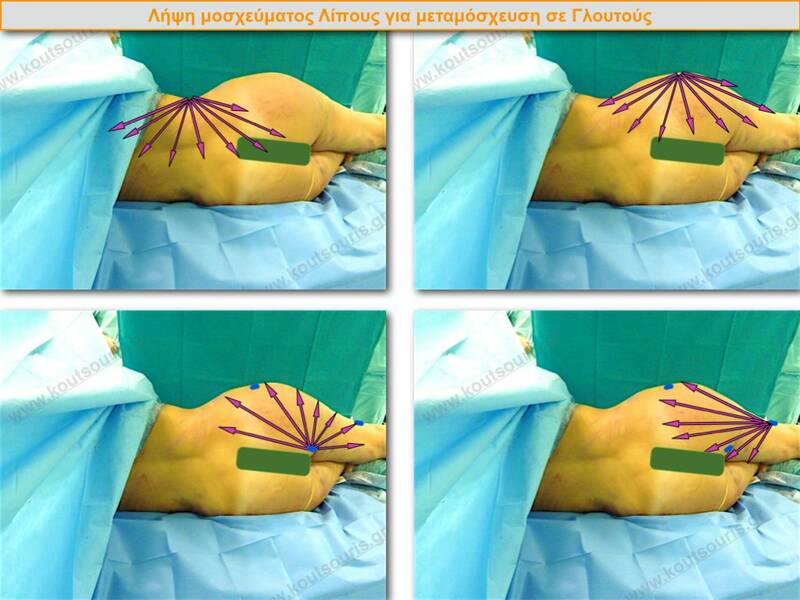 What is the procedure followed during the Fat Transplantation to the buttocks? Then, the extracted fat is centrifuged under aseptic conditions, so that a large number of stem cells and structural adipocytes can be isolated and collected. This fat is transferred into the RECEIVING area – i.e. inside the buttocks. After the liposuction of the side gluteus area,the skin and adipose tissues have been detached from the more profound tissues. We can therefore lift the buttocks from 3 to 7 centimeters, due to the fact that the skin that has been detached during the liposuction is attracted by this special film and settles down in a new, 3-7cm higherposition. Post-surgically, swelling might be formed in the area where we have operated extracting the excess fat, as well as in the area to which we have transplanted it. This might be persistent for a couple of weeks. This is a Laser which has been designed to treat the cellulite while being very beneficial after a Liposculpture treatment, as well. This is because it quickly removes lymphaedema, smoothens the treatment area and improves the cellulite (which more often than not co-exists with local lipodystrophy) state to a great extent. The nuisance or pain completely recede after day 3-5, hence it’s time to stop the intake of painkillers and the only thing that the patient might fell is a little numbness or esthesiodermia that might last about 3-6weeks. We should always bear in mind that even right after the surgery, the patient does not feel any pain at all – only feels numbness or esthesiodermia. However, when in motion, the patient might experience nuisance or mild pain, which can be totally alleviated with common painkillers. Fat Grafting in order to increase or reshapethe contouring of the buttocks is a safe technique when performed in an organized surgical environment, by certified Plastic Surgeons and under the fundamental principles of Plastic Surgery. Skin traumas are in general not frequent and are treated with local care. Fat is a very sensitive tissue and the grafting treatment requires vast experience and meticulousness from the Plastic Surgeon. What are the drawbacks of buttocks augmentation with fat transplantation? 1st. Due to the fact that a 50-70% of the transplanted fat is absorbed, we should transplant double or triple fat quantity so as to attain the desirable rise in volume. This practically means that if the patient does not have sufficient fat then we cannot attain the desirable result and will therefore have to look for an alternative buttock augmentation treatment. 2nd. If we want a very big increase of the buttocks size, more than one sessions might be required. 3rd. Small fat cysts might appear after the fat transplantation to the buttocks due to fat melting. They require diagnosis and a surgical solution – usually diagnostic puncture. 4th. Because the transplanted fat is structural fat, any increase or decline of its quantity over the years, will be noted in the transplanted area. What are the pros and cons of Buttock Augmentation with silicone insets? One biggest advantage of buttock augmentation with silicone insets is that they can be applied to any body type and that the gluteus area reforming is immediate. It is the basic treatment method for thin individuals – people with scarce adipose tissue – or extremely loose skin. A “capsule” might be postoperatively formed, i.e. a reactive adhesive film around the insert (just like in the case of breast silicone inserts), and requires surgical treatment. Consequently, we can affirm that although some very satisfactory aesthetic results, buttock augmentation with silicone inserts has the drawback of a high rate of implications and adverse events that can even reach 60%. What are the pros and the cons of Buttock Augmentation with injectable Hyaluronic acid implant? Both the advantages and disadvantages of buttock augmentation with the use of injectable Hyaluronic acid implant are the reason why Hyaluronic acid is an exceptional implant for human tissues. The Hyaluronic acid is a completely non-active substance which means it is not causing any allergies nor triggers any reactions, forms inflammations, causes malignancies nor forms collagenoses. What is more, it does not tend to move, so it stays where initially transplanted maintaining the desirable result for a long time. Hyaluronic acid is THE ONLY plastic surgery IMPLANT that has an ANTIDOTE. This simply means that “in case I don’t like something” after Hyaluronic acid has been applied or if there is any kind of deformation from a wrong application, then there always is an option of using its ANTIDOTE substance Hyaluronidase to remove the excess or misplaced material, restoring the image 100%. The Hyaluronic acid application procedure is also pretty simple. No surgery is needed for the implant to be inserted – this is usually performed under aseptic condition in the clinic (just like all the injectable face treatments). It is almost painless, given that it is performed under local anesthesia and it is fully controllable by the surgeon. It is significantly costly, mainly due to the big quantity of the material needed. Taking all the above into consideration, it is clear that BUTTOCK AUGMENTATION with FAT TRANSPLANTATION is the most contemporary and innovative method for the atrophic, saggy and flabby gluteus. FAT TRANSPLANTATION is a secure method characterized by effectiveness and constitutes nowadays the METHOD OF CHOICE for the BUTTOCK AUGMENTATION.